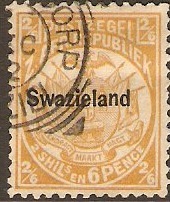 Home :: Swaziland :: Swaziland 1889-1897 :: Swaziland 1889 2s.6d buff. SG7. Fine used 1889 2s.6d buff. SG7.